As ever, the Dalai Lama can be relied upon to get straight to the heart of any problem. Our materialistic, consumer economy is driven by the need to keep selling things to people who do not really need them. 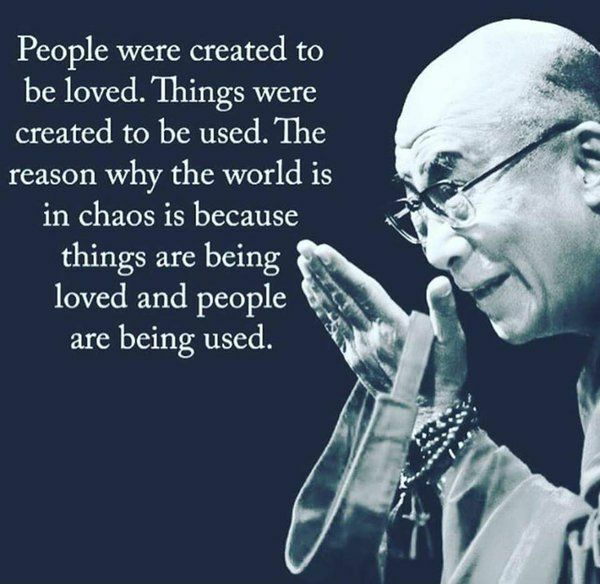 Where objects have become more important than people. The advertising industry sells us shiny toys based on a false promise – that things will bring us happiness. However, as the Beatles so succinctly put it, the reality is that “Money can’t buy me love.”, and possessions won’t really make us happy. There are much better ways to look for happiness. For instance, research shows that healthy relationships help us stay happy and allow us to live longer, healthier lives. Working to maintain our relationships with family and friends may well prove to be a much more succesful plan. I wasn’t always a minimalist. I used to buy a lot of things, believing that all those possessions would increase my self-worth and lead to a happier life. I loved collecting a lot of useless stuff, and I couldn’t throw anything away. This of course lies at the heart of the modern world. There are just too many glittery things designed to catch the butterfly mind, and if we are not careful we end up with a house full of stuff we didn’t really need or want, and what is worse we don’t seem able to part with it. Most of these shiny possessions seem to be kept either to show us that we are a success, or to impress others with our taste. Our things come to represent us rather than our being judged by the content of our character. We have come to inhabit a world in which what we do, and what we have, is taken to define who we are. In the western world we are in a position where too many people have so much stuff that the self storage industry, which is expanding rapidly, can barely keep up with the demand for extra space for all the stuff we now own. After all, once the garage is full where do you store the excess stuff that we bought and never use. Decluttering our lives is an important step in allowing us to free ourselves from this tyranny of stuff. It helps to put us back in control of our stuff rather than the other way round. Truthfully, though, most organizing is nothing more than well-planned hoarding. It is important that we do more than just rearrange the things that are holding us back and actually get rid of our excess baggage. The same is true for other aspects of our lives. Decluttering the mind is also needed. Getting rid of unnecessary distractions, learning to focus on one thing at a time, or ending unhelpful relationships, can also contribute to simplifying our lives. Using mindfulness practices, learning to meditate and removing mental and physical distractions can all help with this. Whenever we buy something we do not need, we waste not only money but also time. The reality is that possessions take up space. This is not only in the physical world, but also in our mental world. Our unconscious mind worries about our stuff even if we think it has no effect. We have to spend money on insurance or storage and become stressed by owning things. Many of the things we buy are like new cars – they can lose thousands off their value as soon as we drive them off the forecourt. Our new toys soon lose their gloss. They get scratched, and then join everything else we have bought as part of the general background of our live. As soon as a new upgrade comes out, we start to fret and “need” the latest model. As ever, popular music can overstate the case. Love is a great help in living a happy and fulfilling life, but love alone is not enough. We do need a certain number of things, money and shelter. It is only in the last hundred years or so that the possessive society has come into existence. Cheaper goods, mass-produced in the new invention of the factory, have become available to all. Perhaps it is time for us to say enough is enough. There are only so many things that we can use at the same time. What do we actually require to live a happy life? The answer to this question will be different for everybody. We do need to ask ourselves this important question. What is enough for me to live my life? You don’t really need much. I try to live my life with that sort of minimalist mentality. This minimalist mentality lies at the heart of the being a minimalist. A determination to leave as small a footprint as possible while at the same time living our own version of the good life. Shepherding the earth’s resources by using only what is absolutely necessary for the life we choose to lead. Resisting the siren call of the throw away society by buying the best goods we can afford and then looking after them. I will finish with some good advice from Fumio Sasaki, author of Goodbye, Things. Holding on to things from the past is the same as clinging to an image of yourself in the past. If you’re the least bit interested in changing anything about yourself, I suggest you be brave and start letting things go. Previous Post Minimalism: over-engineeering the selfie.